Defy gravity in your own giant, air-filled bubble in this unique game of soccer! 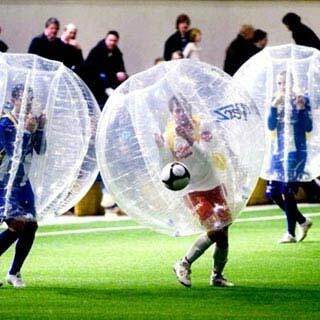 Up to eight people (two teams of four) play the game of soccer while wearing a giant air-filled bubble that completely covers their head and torso. The protective plastic chamber has inner handles and shoulder straps that enable players to literally defy gravity, so they can bounce around, knock opponents out of the way and off their feet while protected inside their inflated sphere. An attendant is included. Bubble Soccer must be played on a level grass surface, preferably in a large enough space for a soccer game, along with two volunteers to assist our attendant with the games throughout the event.